On behalf of the SustainRT Board, it is our pleasure to congratulate the winners of the SustainRT elections. 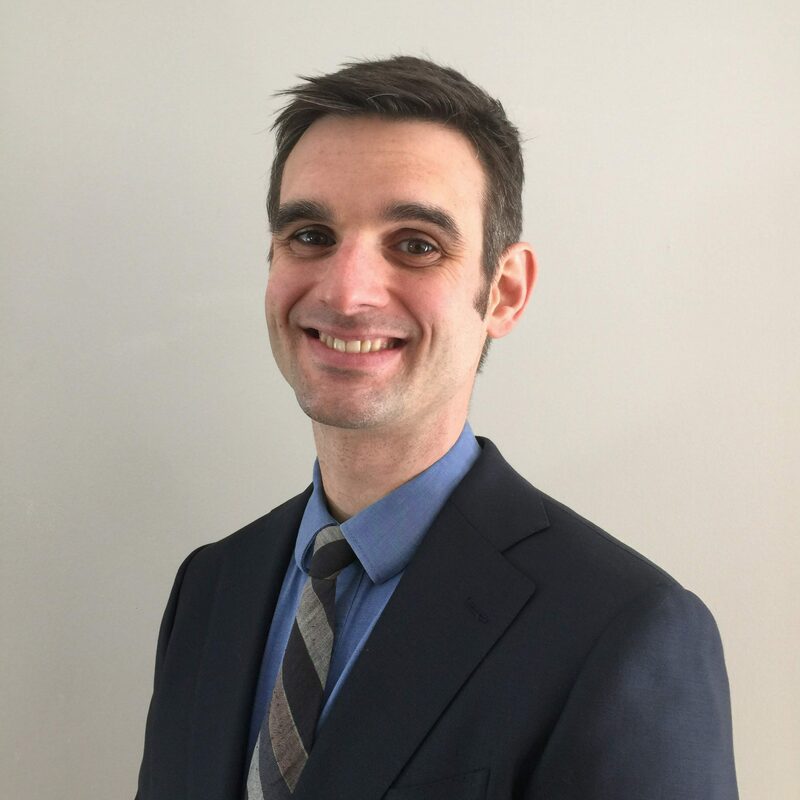 Beginning after the 2019 ALA Annual Conference, Arlene Hopkins will join the Board as a Member-at-Large, Casey Conlin will join the Board as Coordinator-elect, and Matthew Bollerman will join the Board as SustainRT’s first dedicated ALA Councilor. We wish to express our appreciation to these individuals for their commitment to this group, and what it represents, by taking on part of the work of keeping SustainRT moving forward. 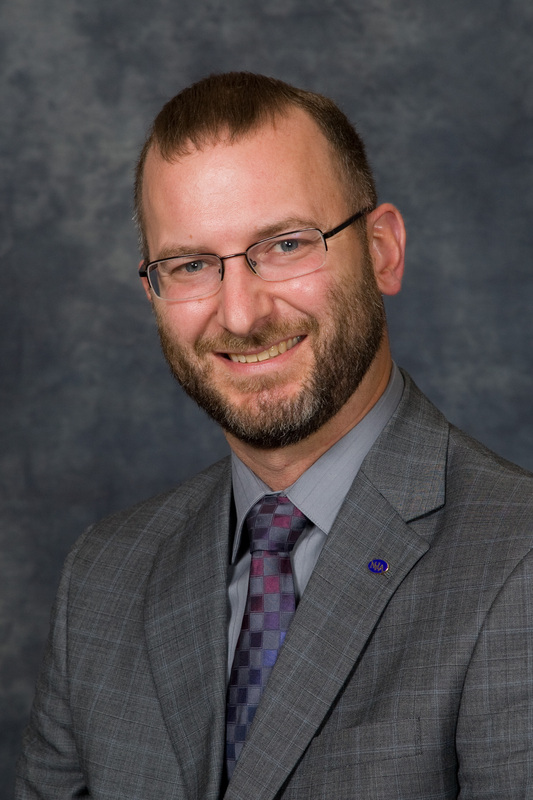 Posted on April 18, 2019 Author sustainrtblogCategories UncategorizedLeave a comment on Congratulations new SustainRT leaders! 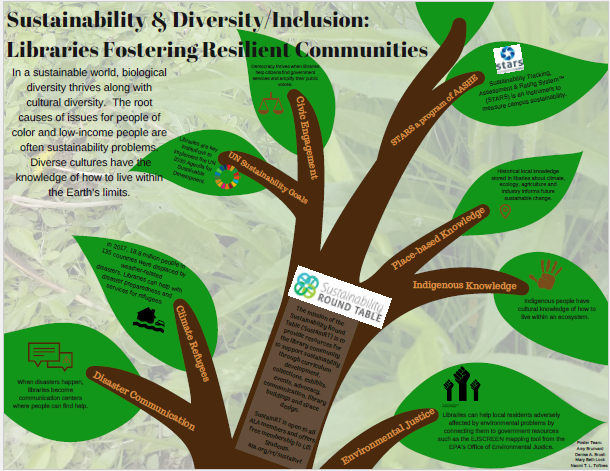 The Sustainability Round Table will offer a $500 travel award to reimburse* a SustainRT member who attends the ALA conference in June 2019. Applicants should submit a blog post (500 word limit) or a video (2 minutes or less in duration) about the connection between sustainability and libraries. Submissions may be creative and should explore the applicant’s unique vision. Agree to write a short (250-500 words) blog post (link to our blog) about their experience attending ALA and/or how they think that the Sustainability Round Table can encourage and support library workers who wish to promote sustainability in their libraries and communities. Entries are due by April 26, 2019. The winners will be notified in May and announced at the member meeting at ALA Annual. The winning submission will also be posted on the SustainRT Blog and other SustainRT social media. All entries will be considered for publication. *reimbursement covers travel and/or lodging and/or registration and/or up to $45 per day in food expenses. Not a SustainRT member? Join now! Log into your ALA Connect account and add us to your ALA membership. It’s only $10 to join! The Global Climate Action Summit (GCAS) 2018 was held in San Francisco from September 12 – 15, 2018. GCAS was an international summit to convene meetings to discuss, explore, share and collaboration with different states, regions, cities, companies, stakeholders on climate action. In addition, affiliated events were also held all week throughout the Bay Area. 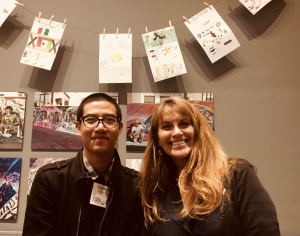 Sustainability Round Table members Ray Pun and Heather Christenson attended an affiliate event called Climate Heritage Mobilization (CHM) held at the California Historical Society. This one day conference was organized by the “California Office of Historic Preservation in conjunction with national and international partners. The event’s purpose is to mobilize the cultural heritage and historic preservation sectors for climate action in support of the Paris Agreement.” In this blog post, they will reflect on their experiences attending the CHM. The Climate Heritage Mobilization gathered over 100 committed people from a wide variety of disciplines to take on the weighty topic of identifying the intersection of cultural heritage and climate change. We were challenged to consider — what are the needs of climate action? What are each of us good at? I was pleased to attend the meeting as member of SustainRT and represent the library perspective. Andrew Potts, Co-Chair of the ICOMOS Climate Change & Heritage Working Group, began the meeting with a comment on the value of having a “cultural heritage meeting at a climate conference, rather than climate meeting at a cultural heritage conference.” A key theme in the many presentations and panels throughout the day was that, ultimately, the solution to climate change will be a social and cultural one as much as a scientific one. Many of the presenters provided very specific cultural perspectives, and in aggregate these perspectives formed an encouraging kaleidoscope of possibilities and examples. A takeaway here is that no one size fits all, the local community knows best and needs to be involved, and at this critical moment, all solutions should be on the table. One remarkable panel showcasing “Heritage as a Vector for Climate Action, Justice, and Research” featured speakers that included Queen Quet of the Gullah/Geechee Nation, Dr. Brenda Ekwurzel, a Sr. Climate Scientist at the Union of Concerned Scientists, Alison Tickell of Julie’s Bicycle, and Saúl Vicente Vásquez who coordinates community efforts with the FAO in Oaxaca Mexico. Queen Quet challenged the group to consider wide cultural inclusion to work effectively together, pointing out that even our social, talkative, lunch at a restaurant represented a cultural norm not shared by all. Dr. Ekwurzel described artifacts being revealed by the retreat of Arctic ice, and how “archaeology can’t happen fast enough – how can you even prioritize?” Mr Vasquez described how culture can be a key component of food security and how ”food sovereignty” based on local wisdom rather than an industrial model was achieved by his community. Alison Tickell described how her organization funds strategic integration of climate change as a theme in the arts, in order to normalize climate change and integrate it into mainstream culture. Localization and community involvement in solutions was a common theme, and speakers described how direct experiences with the effects of climate change have resulted in increased political and social action. For example, Daniel Zarrilli, Senior Director of Climate Policy and Programs for the City of New York, described how in 2012 Hurricane Sandy was a turning point for the city in addressing climate change. “What actually changed was…reality! It is now not in the future,” he said emphatically. I was impressed with the diversity and scope of subject matter presented at this meeting, and with the intelligence and enthusiasm of all the speakers. At the group lunch, connections were made as conversations turned to people’s children and to commiseration over the feelings generated by the daunting topic. If nothing else, awareness of the number and variety of actions being taken, and many people involved across disciplines is heartening. I would encourage my colleagues to seek out cross-disciplinary meetings such as this one, if possible, and forge connections outside of the library sphere. Our wisdom as stewards of our collections, and long view of preservation, format migration, and availability of resources over time should be shared more widely. Libraries are also at the center of community, and we as librarians also have wisdom to share regarding frameworks of community support and engagement. CHM was a great opportunity to explore and learn from politicians, policymakers, conservators, academics, architects, librarians, activists, preservationists, and scientists were working collectively on to address how climate change affects cultural heritage. I attended this conference on behalf of IFLA (International Federation of Libraries Associations and Institutions) to identify opportunities for future partnerships on how libraries can support and preserve cultural heritage collaboratively. Many speakers addressed what is Climate Heritage Mobilization and why does it matter from their perspective? One presentation that stood out to me was Executive Director Andrea Carmen’s talk on indigenous perspective relating to climate heritage. Carmen is from the Yaqui Nation and International Indian Treaty Council; she presented on the indigenous knowledge of resilience, and the ongoing teaching and learning process that should include indigenous people when addressing climate changes that deeply affect their communities. She shared different examples of how Native Americans have protested and raised concerns of climate change and how to include their rights into international treaties and recognitions. In addition, there were presentations from mayors around the world including Assisi in Italy and Chefchaouen in Morocco to share how urban planning process in addressing climate change and in support of cultural heritage. During this day-long event, I met with many advocates including museum professionals from International Council of Museums (ICM) who were interested in collaborating with libraries and archives in supporting conservation and preservation approaches to cultural artifacts including books, manuscripts and archival documents. I thoroughly enjoyed the many different talks because this really gave me a multiperspective on of what other professionals are doing. For example what architects are doing or what policymakers are interested in to address climate heritage. What can and should libraries do? There are definitely ways for our group (Sustainability RT) can consider from liasioning with different organizations and associations to creating more outreach and awareness of climate heritage too. You can also find the discussions on social media, particularly Twitter under #climateheritage for more information about this affiliate event. You can also follow #GCAS2018 to explore other past events too. Sign up for updates with the Climate Heritage Mobilization! 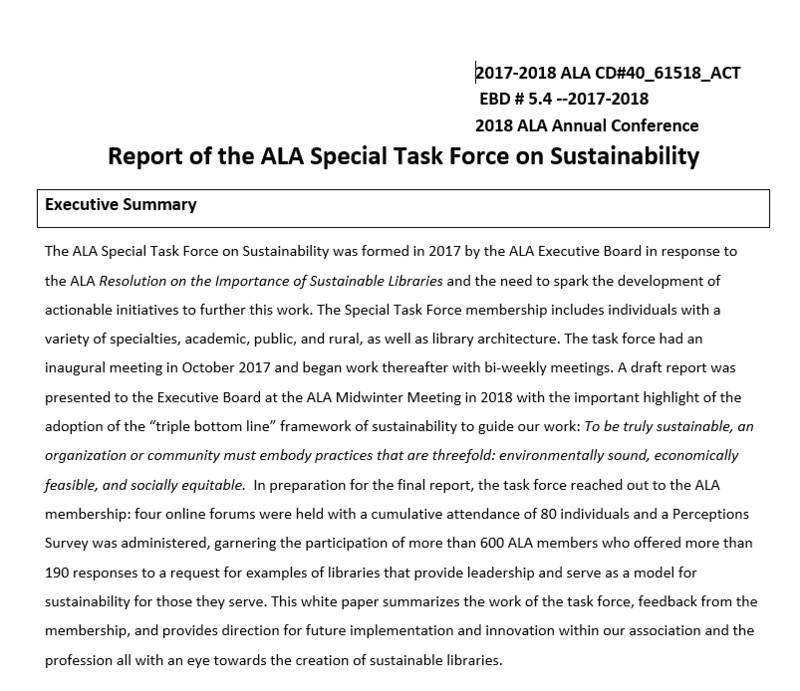 The Report was accepted by ALA Council at the ALA Annual Meeting, 2018 (New Orleans, LA: June 21-26). A final version has not yet been approved. The Journal of Critical Library & Information Studies is seeking submissions on the theme of libraries and archives in the Anthropocene. Deadline for submission, June 30, 2018. Please read the attached .pdf for details and how to submit. If like me, you are hovering in the dark spaces between Kubler Ross’s bargaining, depression and acceptance, there is some comfort to be had in the words of Elizabeth West, in Abandon All Hope!. West boldly implores us to “abandon all hope that we can make things ‘right’ and give up the fear of what happens next.” I think I have the former part down; it’s the latter I am having trouble with. There is not one single bolt, nut, knob or straw comprising the foundation of my day-to-day existence that does not depend upon the (collective) assumption that the future will resemble –for the most part– the present. Many of us in the industrialized world take for granted that we will continue to enjoy all the current “conveniences” civilization offers us. Things like education, health care, prescription drugs, supermarkets, paved roads, phones, cars, buses, email, houses, etc. We assume a continuous, shared belief and agreement in such concepts as law, justice and order, amongst others. At the very least, we assume the basics: food, water, air. Each other. And we march onward, as if. This assumption is in direct conflict with a dark undercurrent of fear that doggedly gnaws at me daily; I know very well the future does not look like the present. But because I don’t know what the future will look like, I don’t know what to do. I don’t know how to prepare, how to get ready, how to survive. I don’t even know if survival is possible. And this not knowing– this is makes me most afraid. If only we knew what it was to be. Will it be the guillotine or will it be prolonged suffering in a torture chamber of disease and unspeakable violence? Will we starve? Will there be animals? Will there be water? Will there be radiation sickness? Will we be alone? Will we have tribes? Will our children die in front of us? Will we die in front of our children? All I know is all roads lead to a hard geography, a reality of scope and dimension we cannot fathom. We are truly the walking blind. Lack of hope is an ugly thing. Surely denial would be better, “a form of fearing and avoiding the truth [that] keeps us from cracking up, giving up. It stands between us and the unbearable.” But once the curtain has been pulled back, once a sightline to the “little man behind the curtain, pulling strings” has been established, returning to the false safety of denial is impossible. It is no stretch to say that the current state of xenophobia racking our world, one in which those seeking refuge from domiciles which do not enjoy the same benefits of civilization that we do are denied entry into ours, whether by walls or by ideology, is an obvious effort to maintain the false safety of denial. The knowledge that immigration policy means nothing in a world that depends upon civilization for the word “policy” to have meaning, the knowledge that no matter what we do, we will not achieve “long-term security and comfort… economic or racial justice or equality, [we] will not stop the ice sheets from melting or the radioactive Fukushima-spiked water flowing into the sea” is a hard one. I am not quite there yet. I am guessing few of us are. In the meantime, we still have each other. And don’t forget you can respond publicly to this post in the comments field. Jodi Shaw is a librarian and writer living in Massachusetts. 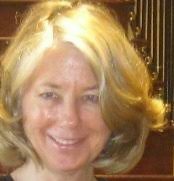 She is the Coordinator of the ALA Sustainability Round Table.